Caulfield Railway Station was opened with the line to Oakleigh in 1879. The first station buildings were erected on the site in 1881 and 1883. The current station was constructed in 1913-14 to provide improved and additional facilities to what had become an increasingly busy and important location on the train network. JW Hardy the chief architect of the Victorian Way and Works branch was responsible for its design. 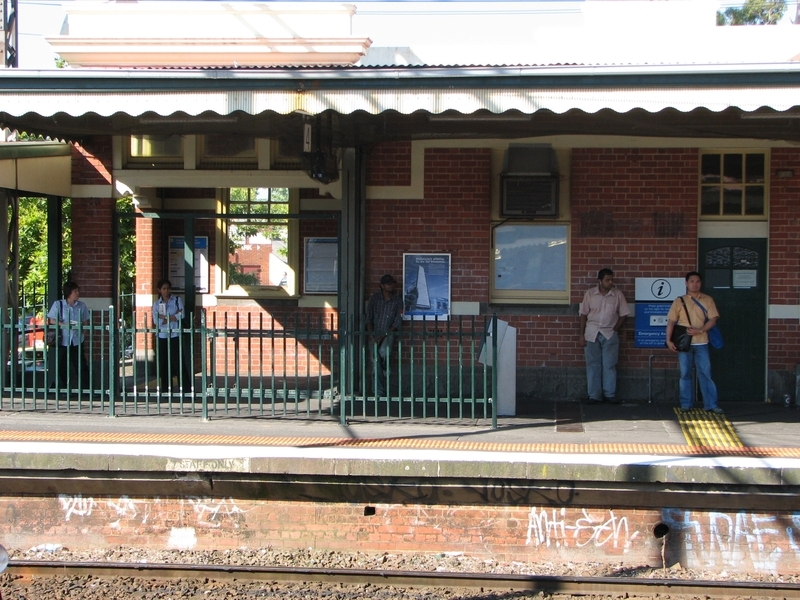 The Caulfield Railway Complex consists of four passenger platforms, horse platform, subway, three principal station buildings, a former lamp/store room and a signal box. The station buildings are of red brick with render banding. 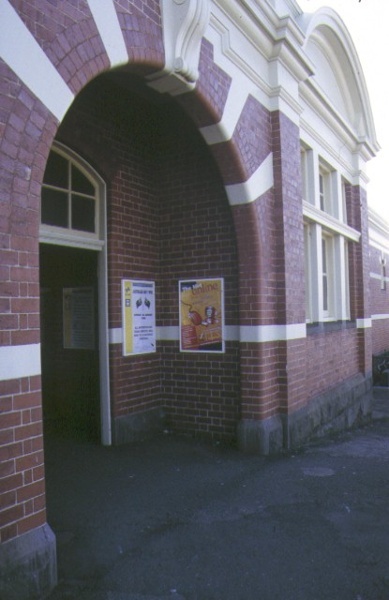 Distinct architectural features of the three station buildings include ornate parapets and radiating bands of render around the arched openings. The platforms are shaded by cantilever canopies which are supported by curved I beams and clad in corrugated iron, with a ripple iron valance. Fittings that have been retained and probably dating from 1914 include the timber palisade gates, a female toilet, timber seating, ticket office fittings on platform 4 and a drinking fountain on platform 1. The signal box was constructed c.1920 and is also of red brick. It has a tiled hip roof and retains the fittings in the signal room. The Caulfield Railway Station Complex is of architectural, aesthetic, social and historical importance to the State of Victoria. 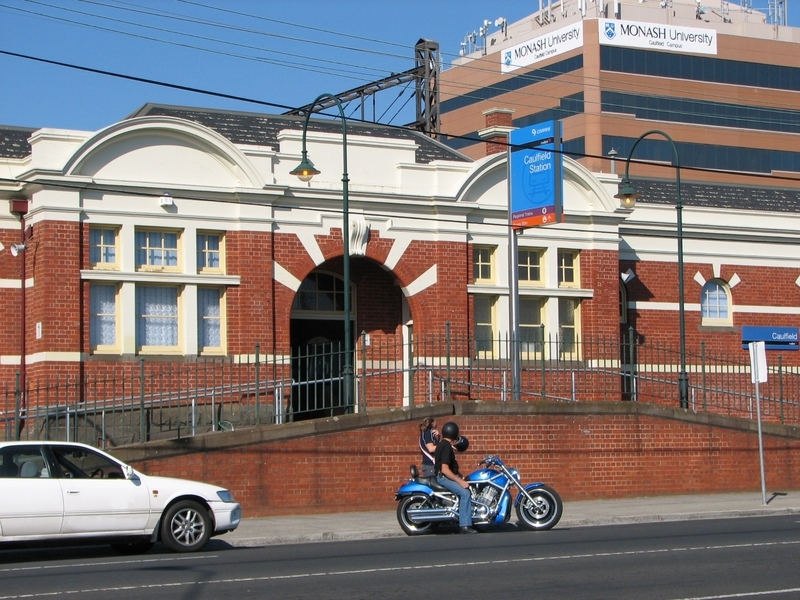 The Caulfield Railway Station Complex is of architectural and aesthetic importance as an imposing Federation Free Style complex, and is an important example of the work of Victorian Way and Works Architect JW Hardy. Details of note include, cement render banding terminating in a radiating design around the archways and an undulating parapet design. The horse platform, though physically undistinguished, is a rare structure of its type. The station is an excellent representative example of a Railway Complex of the era as it contains numerous intact structures as well as objects thought to be contemporary with the buildings. These objects include the female toilet and drinking fountain on platform 1, timber seats and palisade gates. The buildings demonstrate the early use of reinforced concrete in the lintels, slabs to floors and ramps. The Caulfield Railway Station Complex is of social and historical importance for its role as a point of arrival and departure for horses and patrons of the Caulfield Racecourse. The complex is important for its potential to yield information on the changing nature of railways, locomotive technology and public transport use in Victoria, being an excellent intact example of the type of stations constructed immediately preceding the First World War. Because of its retention of detail, the station provides valuable insights into social attitudes and railway practices at the time it was constructed. 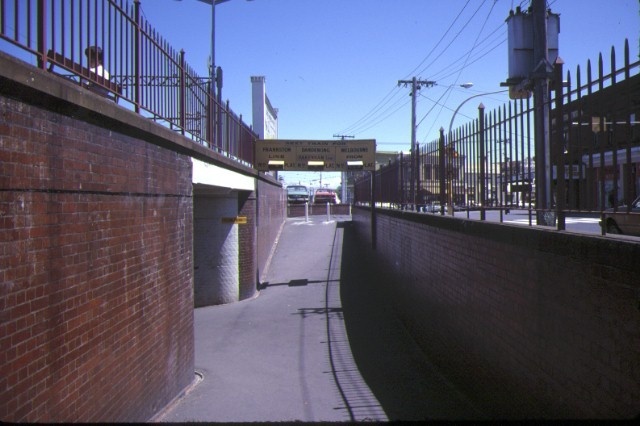 The Caulfield Railway Complex demonstrates the expansion of Melbourne, the settling in the suburbs and in particular the establishment of Caulfield as a major metropolitan centre. The construction of a larger station in 1914 represents a boom period in the history of Caulfield. 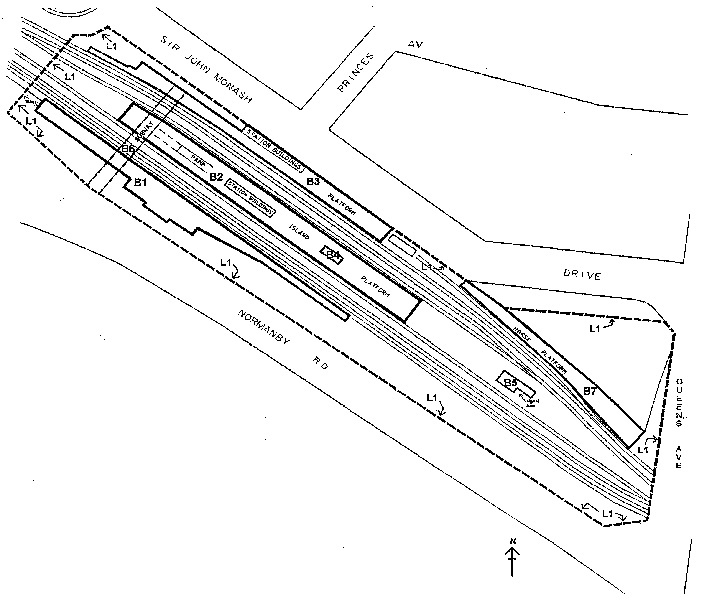 Caulfield Railway Station Complex, Normanby Road, North Caulfield, Glen Eira City Council. 1. All the buildings and structures marked B1 Station Building and Platform 1 off Normanby Road, including remaining female toilet and seat, timber palisade gates, drinking fountain and timber seating; B2 Island Platform and Station Buildings including timber palisade gates; B3 Station Building off Sir John Monash Drive and Platform 4, including timber palisade gates, B4 former Lamp Room/Store on Island Platform, B5 Signal Box and associated internal fittings; B6 subway, B7 Horse Platform on Diagram 603976 held by the Executive Director. 2. All the lan dmarked L1 on Diagram 603976 held by the Executive Director, being part of the land described as Crown land vested in the Public Transport Corporation by virtue of sections 231, 232, 233 of the Transport Act 1983 as amended. 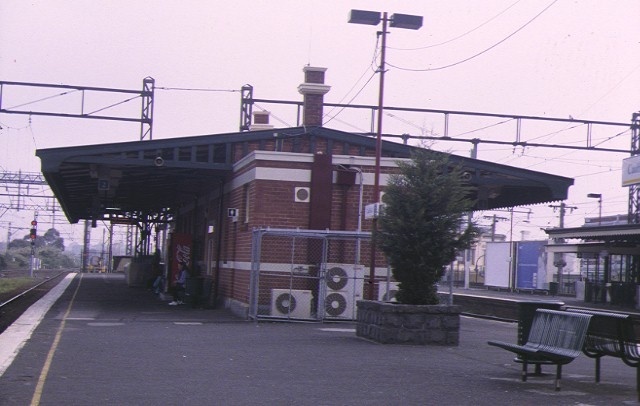 Caulfield Railway Station is identified in Andrew Ward’s Railway Station Study as belonging to the Essendon Group of Railway Stations. This group is one of several designed to provide improved, and occasionally additional, facilities at important locations on the network. The majority of examples are situated in the metropolitan area, for it is here that traffic growth was most intense. This style blossomed around 1910 and was extinguished sharply by the outbreak of the First World War. Reinforced concrete was emerging at this time as a useful building material and it was used in these stations to form lintels and slabs to floors and ramps. The slab soffits at Essendon are finished with cement rough cast and 60lb rails are substituted for reinforcing bars. The plan form consists typically of an island platform building, accessible via a pedestrian ramp and subway, and a secondary building handling passenger and parcels traffic on a side platform with road access. The main building, located at the head of the ramp, consists of the station master’s office, backing onto the general waiting room, then the ladies waiting room, ladies toilet and finally, the men’s toilets. The plan of the secondary building varied. The principal features of the facade were classical, presented in an Edwardian manner. They included Romanesque archways and segmentally arched windows, circular and triangular pediments and cornices, - at Caulfield, and keystone motifs over windows, and archways. Other details, by which this style can be quickly recognised, include cement render banding, terminating in a radiating design around the archways, and the use of cement roughcast in conjunction with glazed olive green tiles forming parapets above the verandah line. The windows are frequently formed by large Romanesque arches with multi-pane upper sashes. The picturesque roof line, characteristic of Edwardian Style buildings, was achieved by means of an undulating parapet motif above the line of the cantilever awning. It was complemented by the arched windows and openings, linked together with vestigial cornices. Inside, the linings were either vee-jointed timber or pressed sheet metal featuring spidery “art nouveau” patterns . Caulfield station was opened with the line to Oakleigh on 2.4.1879. The first buildings were erected under contract No. 1424 by W. Swanson, signed 22.7.1881. A shelter shed and booking office followed under contract No. 1857, signed by J. Brown on 1.3.1883 . Two additional tracks were provided between Melbourne and Caulfield from 4.10.1915. Working drawings were prepared for the present station buildings prior to this date, those required for platform 4 being signed by the chief architect of the Way and Works Branch, J.W. Hardy, on 3.10.1913. The platforms 1, 2 and 3 buildings followed on 23.1.1914 and were also signed by J.W. Hardy . Accommodation on the No. 1 platform also included a “station master’s look-out”, demolished in the early 1980s and four first and second class entrances arranged so as to handle racecourse patrons according to their ‘class’ and gate entry numbers. A horse platform with small office was provided to the immediate east of the No. 4 platform and it remains, out of use, today . The station has been identified in Andrew Ward’s study as being part of the Essendon style group. This group is one of several, designed to provide improved, and occasionally additional, facilities at important locations on the network. The majority of examples are situated in the metropolitan area, for it is here that traffic growth was most intense. James Hardy had been a draftsman with the Existing Lines Branch since 1881 and was appointed to the new office of Chief Architect in 1908. He held the position of Chief Architect for the Department of Way and Works until 1918. 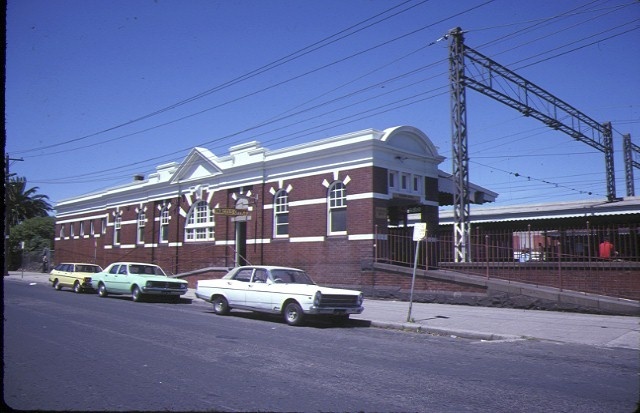 Hardy was also responsible for the railway stations at Malvern, Armadale, Toorak and Hawksburn, the group of stations between South Yarra and Caulfield, as well as Camberwell Station . Normanby Road Platform: General Waiting Room, Booking and Parcels Office(extant), Booking Hall (entry doors gone), Ladies Waiting Room and Ladies Closets now one room (one original toilet remaining), Book Stall, Sink, Gates, Urinals and closets (converted into office). Does sink mean drinking fountain or just drain? Island Platform: Gates, Booking Parcels Telegraph Office, S.Ms Office, General Waiting Room, Porters Room, Lamp Room, Room added after 1916 does not include verandah. Changed plan to all rooms to contain a series of offices. 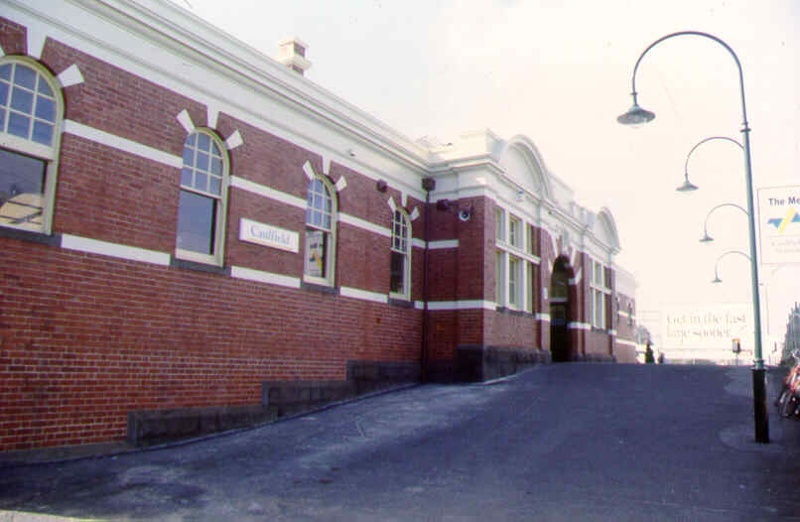 Sir John Monash Drive: Gates, Booking Hall, Booking Office (contains original cupboards), General Waiting Room, Ladies Waiting Room, Ladies Closets, urinals and Closets, Signal Box (extant but not in this position), Coal Box. The Caulfield Railway Complex's social importance derives from its role as the point of arrival and departure for patrons of the Caulfield racecourse. The Caulfield Railway Complex demonstrates the expansion of Melbourne and the establishment of Caulfield as a major metropolitan centre. The construction of a larger station in 1914 represents a boom period in the history of Caulfield. The Caulfield Railway Complex may include the only horse platform on the rail network. The complex is important as a rare example of a particularly intact complex, which still includes original gates, drinking fountains and an original toilet. The Caulfield Railway Complex is an important example of the application of the Federation Free Style to station building design and one of the finest complexes attributed to J. W. Hardy, chief architect of the Way and Works Branch from 1908-1918, comparing with Auburn and Glenferrie (c. 1918) and Spotswood (1912). 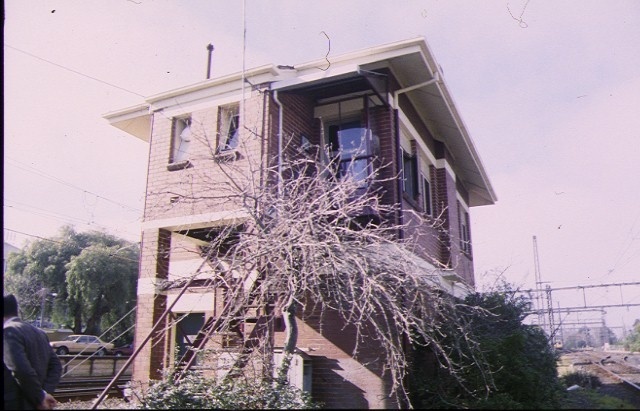 The Caulfield Railway Complex is an important intact example of the Federation Free Style of station buildings. It has retained many of its ancillary buildings including the former lamp room and signal box.